M.S. 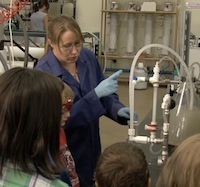 in Environmental Engineering from the Colorado School of Mines. Xanthe's research focused on developing computer tools to predict the configuration of systems for treatment of impaired water, and specifically produced water from coalbed methan. Additional focus in her research was on development of models for design and performance prediction of advanced hybrid membrane systems for combined desalination and wastewater treatment. Her research was funded by the DOE/RPSEA and by Texas Water Development Board.